The newly formed and recently launched ‘Well Society Business Club is now up and running. It made its first successful presentation to a number of local businesses here at Fir Park last week. The aim of the Business Club is to help its members be more successful through regular meetings and using a range of benefits, support the community in a meaningful way and work more closely with the ‘Well Society and Club to achieve their target of fan ownership. The format of last weeks meeting was based on a number of short interesting presentations by Motherwell FC CEO Leeann Dempster, Charlie Bennet, Head of Community, Paul Burns Youth Academy and Graham Barnstaple from the Well Society, as well as Doug Inglis and Douglas Dickie from the Business Committee who explained the benefits of membership. All of these disciplines depend on each other for their future success. A copy of the new brochure and an Application Form is available can be easily downloaded. The next presentation will take place in Fir Park at 7.30pm on Thursday 20 June. Please come along and learn how membership can help your business and the Well Society. We hope to see you then or at one of our other presentations. If you are unable to attend please contact us and we will arrange a separate meeting to explain the benefits of membership. The club is delighted to confirm English Premier League side Newcastle Utd will travel to Fir Park for a pre-season friendly this summer. The Steelmen will face Alan Pardew’s Europa League Quarter Finalists as ‘Well prepare for the forthcoming European and Scottish Premier League campaign. The Magpies have a wealth of talent in their ranks, including the likes of Fabricio Coloccini, Yohan Cabaye, Pappis Cissé and Hatem Ben Arfa. The match will be played on Tuesday 16th July 2013 – kick-off will be 7pm. More pre-season friendly matches will be announced as soon as they are confirmed. Motherwell FC can confirm Henrik Ojamaa has joined Polish Ekstraklasa Champions Legia Warsaw for an undisclosed fee. The Estonian sharpshooter joined Motherwell from RoPS in the 2012 January Transfer window and made an immediate impact, scoring five in his first six outings, including a debut stunner against Queen’s Park in the Scottish Cup. He has gone on to play 64 times in Claret and Amber, scoring 13 goals with 24 assists, helping ‘Well to two successive ‘Best of the Rest’ finishes in the Clydesdale Bank Premier League. Whilst at Fir Park, he also broke into the Estonian International side and made his senior debut against Croatia back in May 2012. He has since gone on to win ten international caps for the Sinisärgid during his time at ‘Well. There was significant interest in Henrik from not just one Polish side, indeed, Motherwell have knocked back two bids for the player in the last six months. Everyone at Motherwell Football Club would like to thank Henrik for his contribution during his spell at Fir Park and wish him every success in his future career. Following the welcome decision of Stuart to remain as manager, the Board wanted to take the opportunity to update all Society members and supporters on the overall performance of the club at the end of another enjoyable and important season. In our communications we want to remain fully transparent and clear about our performance, prospects, risks and opportunities. We have done well but the landscape of the game in Scotland remains challenging and material risks continue. Significant progress must be made if we are to achieve our goal to be a fully sustainable fan-owned and community focused club. Achieving a second place league finish and qualifying for Europe for the fifth time in six seasons was a tremendous result. We’d like to thank everyone involved with both the playing and backroom staff for their hard work during the season, which made this possible. We are sure everyone enjoyed the style of football and the competitive nature of the league. Our Under 20s team went through a period of transition with a very young squad and a change of coach, with Gordon Young taking up his role as Academy Director and Jonatan Johansson taking control on a day-to-day basis. After a challenging start to the campaign, the young players provided some real hope in the closing third of the season, remaining unbeaten in the last six matches and finishing the second half of the season with treble the points of the first. Jonatan and the club staff will work hard to develop and recruit players with the ultimate ambition of feeding the first-team squad. Off the field we have re-structured our Commercial and Academy operations while continuing to expand our Community Trust. We believe that these three key areas are now extremely well placed to deliver value for the club, supporters, sponsors and other partners. The ‘Well Society has made good progress during the year achieving important milestones of appointing a Board, making an initial share subscription and having two Directors appointed to the club board. Graham Barnstaple and Brian McCafferty are not only the representatives of the ‘Well Society but importantly play a full and active role in all club decision making. Financially we benefited from finishing second in the league however the prize money was reduced due to the agreed redistribution of a proportion of the second place prize pot to all clubs in January. We also achieved lower than expected cup and transfer income and like many other clubs, a drop in our SPL pay at the gate revenue, which for us was approximately 10%. This was partially offset by an increase in season ticket numbers. Whilst the numbers have yet to be finalised, we expect the outcome for the season to be a low six figure loss. Putting this into a context that the regular supporter can easily understand, had we progressed one more round in the Scottish Cup, the club would be reporting a small profit. Equally had the gates at each home game been around 500 higher, we would have achieved a break-even position. The financial position of the club was assisted by the initial share subscription from the Well Society of £150,000. Whilst those funds now belong to the club, they currently sit ring fenced in a separate account with the intention that they will continue to be used only to cover short-term cashflow gaps if possible. All other funds raised by the Society continue to sit outside the club and there are no immediate plans for any additional ‘Well Society support in the short term. We continue to operate without any assistance from either a bank or a benefactor and aim to run the club at break even. After covering the normal costs of running the club, all income generated is invested in the playing squad but the flip side is that when we suffer a reduction in our income, we have less to spend on players. The club, in partnership with the Motherwell FC Community Trust, is working on a project that will hopefully see the development of an Employability and Sports Training Hub / Facility in North Lanarkshire. Due to the expansion in the number and the breadth and depth of programmes being delivered by the Community Trust, particularly around youth unemployment, health and wellbeing and increased participation in sport, there is a requirement to develop new dedicated facilities for this extended programme delivery which will also be available to strategic and delivery partners as well as community groups. The club and the Community Trust are proud to be leading this exciting project, which, if approved, will benefit local people for many years to come. We are delighted to confirm that our principal club shirt sponsor, Cash Converters, have confirmed an extension which will see them remain as our main shirt sponsor through season 2013/14. This has been a very positive and innovative partnership, which we hope will continue for at least another season and possibly beyond. Their commitment and support to the club has been first class and their contribution, through interesting and fun match day activities has been excellent to date. The club are in the first year of a three-year partnership with Maxim Office Park to rename the South Stand to the Maxim Park Office Stand. This partnership is also supported through highly visible branding on the stand. As most will know, there remains much uncertainty around the level of funding all clubs will receive from the Scottish Premier League (SPL) next season. Last season, central funding from the SPL accounted for 34% of our total income. At the time of publishing, the SPL has no main sponsor for next season to replace the Clydesdale Bank, and the financial impact of any re-structure remains to be fully quantified. For budgeting purposes we are assuming a drop in central revenue for next season. Against this background, it is vital that we are able to generate as much as possible from season tickets, through gate money, sponsorships and commercial revenue if we hope to retain and attract the quality of players we have become used to seeing at Fir Park over the last few season. Absolutely key to this is season ticket income. We have worked hard to offer value for our season ticket holders and would ask all our supporters to either renew or seriously consider buying a season ticket for next season. Whilst other revenue streams are clearing important, the more money we are able to generate before the season begins, the more we have to invest in players. We can also not over state how important the ‘Well Society is to the future of the club. We remain fully committed to transferring a controlling shareholding in the club to the Society but this can only be done once it has sufficient funding to be able to operate without risking the future of the club. The Society currently has 1,164 members and has to date raised close to £420,000, 28% of the original target. Again we would ask all Motherwell fans to seriously consider joining. We believe this is the right model for club ownership in the long term and we will continue to work with the Society Board to do all we can to get to this outcome. The Board would once again like to thank all who supported the club last year and look forward to welcoming everyone for the Europa and League campaigns in early August. The latest in our Sunday brunch series is this weekend when Scotland’s top football impressionist Paul Reid is the guest at Fir Park. It would be a perfect way to treat your dad the week before Father’s Day? Not only will you be treated to a set from Paul Reid, as well as a fantastic lunch, every dad will also receive a special gift on the day – a Motherwell FC hipflask. The event will start at 12.30pm and is priced at just £25. Since last October, when the society was handed over to the fans by the club, I am happy to report that we have made good progress on a number of fronts. Publicising the society in a range and variety of ways, such as stories and updates in local and national newspapers, including the Motherwell Times and Wishaw Press, the Daily Record, The Herald and Scotsman, as well as the BBC and Sky News. Last year, despite finishing third in the league, the club made an operating loss of over £500k. Despite finishing second in the league this season, the club experienced a much lower than expected income from transfers and gate revenue, as well as having to pay for extra bonuses to management and playing staff. On top of all that, the SPL has not signed up a new sponsor for next season. All of which means that the club relies on the society for financial support at crucial times of the year. I am also pleased to report, therefore, that we have assisted the financial position of the club through a share subscription of £150k. This provided a much needed cash injection during the months of March and April to alleviate a temporary shortfall. Your board and the club board are committed to the society model. We both want the club to continue to be successful through prudent financial management and without any assistance from a bank or a single benefactor or consortium. We both want to achieve fan-ownership of the club sooner rather than later. So, if we are to achieve our purpose of acquiring a majority shareholding in the club as well as providing a financial safety net, we need urgently to recruit many more members. To do that we need the help and support of current members to persuade their friends and fellow fans to join the revolution and get involved in the work of the society. I would like to thank all those members who have supported the society and helped in various ways, such as organising events, participating in planning groups, or giving out leaflets, and so on. I would also urge more of you to volunteer and get involved in whatever way you can. Finally, I look forward to celebrating with you the club’s success in Europe next season! An emotional Chris Humphrey left Fir Park for the last time this afternoon full of memories of his four years at Motherwell. The Jamaican international signed a deal with English League One side Preston North End, bringing to an end a fantastically successful spell in Claret and Amber including two ‘best of the rest’ finishes in the SPL, a Scottish Cup final and twelve matches in European competition. It has been a rollercoaster of emotions for the 25-year old, who overcame personal tragedy early in his ‘Well career to mature both on and off the field. Speaking exclusively to MFC TV for the final time, the former West Bromwich Albion and Shrewsbury Town winger said: “Your emotions don’t really kick in until you actually sign somewhere else and it dawns on you that you won’t be coming back. “I’ve loved my time at Fir Park, I’ve met some great people and made lifelong friends at the club and the football has been great for me too; it really suited for wingers up in Scotland. “When I first signed back in 2009, everyone knows some of the issues and problems I had off the field and the club were fantastic during that time, giving me the time off with my family that I needed. “It’s times like that which makes this such a special place and why leaving is so hard. But I am looking forward to the challenge at Preston in what should be a very competitive league. Chris Humphrey has today signed a three-year deal with English League One side Preston North End. The Steelmen had offered the 25-year old winger a new deal but he has opted to return south of the border and will officially join the Deepdale club on 1 July. Humphrey leaves Fir Park after four fantastic seasons in Lanarkshire following his switch from Shrewsbury in the summer of 2009. He played 163 times in Claret and Amber, scored nine goals and has a countless number of assists. Included in the games total are twelve matches in European football, including Europa League appearances against Steaua Bucharest, Odense BK and Levante U.D. and a UEFA Champions League outing against Panathinaikos. During his term north of the border, the pacy winger was considered for the Scotland squad due to his Kilmarnock-born mother, but was eventually capped by the country of his birth, Jamaica, last summer. Humphrey was subject to interest from a number of clubs but has chosen to join Simon Grayson’s side as they prepare to battle for a return to the English Championship. Everyone at Motherwell Football Club would like to sincerely thank Chris for his outstanding contribution over the last four years and wish him every success in his future career. Stevie Hammell has been called-up to the Scotland International squad for the 2014 World Cup qualifier in Croatia, nine years after winning his first and last full cap. The 31-year old last turned out in dark blue back in November of 2004 – a 4-1 friendly defeat by Sweden at Easter Road with the late Tommy Burns in temporary charge. With the lack of an established left-back over the years, Hammell, who has played an incredible 464 times in Claret and Amber, can perhaps feel a little unlucky to not have amassed more appearances for the national squad. He has, however, turned out for the ‘B’ squad on more than one occasion. 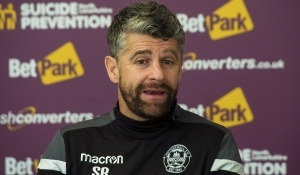 Now, with the current (Stuart McCall) and former (Mark McGhee) Motherwell manager involved in the coaching set-up, Hammell has been included after Charlie Mulgrew was forced to miss the match and injury concerns over Lee Wallace, Danny Fox and Phil Bardsley. Hammell, who is the first ‘Well player to be involved in the senior Scotland squad since Steven Saunders played against the Faroe Islands back in 2010, said: “People might say there have been a lot of call-offs but that doesn’t matter in the slightest to me because it’s a fantastic honour to represent your country. “I was thrilled to bits when the gaffer [Stuart McCall] rang me on Wednesday. At first I thought he was winding me up then he said he was deadly serious and that Gordon wanted to know if I was available. Everyone at Motherwell Football Club would like to congratulate Stevie on his richly-deserved call-up and wish him all the best in Zagreb.